My research currently revolves around the Compact Muon Solenoid at CERN. I am currently serving as the CMS Physics Co-coordinator. The CMS features nearly complete solid-angle coverage and can precisely measure electrons, photons, muons, jets and missing energy over a large range of particle energies. The BU group at the CMS are making significant contributions to physics analyses involving searches for new particles. "Search for W' to tb in proton-proton collisions at sqrt(s) = 8 TeV", CMS Collaboration, JHEP 02 (2016) 122. “Search for a W′ or Techni-rho decaying into WZ in pp Collisions at sqrt(s) = 7 TeV”, CMS Collaboration, Phys. Rev. Lett 109 (2012) 071803. "Observation of a new boson at a mass of 125 GeV with the CMS experiment at the LHC", CMS Collaboration, Phys. Lett. B 716 (2012) 30. 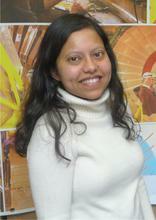 Tulika Bose is an Associate Professor of Physics at Boston University and is currently serving a two-year term as the Physics Coordinator for the CMS experiment. She received her B.A. from Cambridge University where she worked as an undergraduate on the measurement of the W mass at the OPAL experiment at CERN. Her Ph.D. research at Columbia University focused on a search for Bs oscillations at D0 and led to the first double-sided bound on the oscillation frequency in 2006. She helped install and commission the D0 Silicon Track Trigger and served as the onsite operations coordinator. Her post-doctoral research at Brown University focused on direct searches for new phenomena at the D0 and CMS experiments. She served as an on-call expert for the D0 data acquisition system and helped design and optimize the first trigger menus for CMS. She joined Boston University as an Assistant Professor in 2008 and played a lead role in the commissioning of the CMS High-Level Trigger during the 7 and 8 TeV runs. As the CMS Trigger Coordinator during the start up of the 13 TeV run, she had overall responsibility for the operation of the trigger and for ensuring that CMS collected the necessary datasets for both discovery and precision physics. Her physics interests on CMS include precision measurements of diboson cross sections and searches for new heavy gauge bosons and top quark partners. She has served as the convener of the CMS Beyond 2 Generations physics group and also as the subgroup convener of the CMS Standard Model Diboson Group. Her work has been recognized by a prestigious Alfred P. Sloan fellowship and a CMS Distinguished Researcher award. Bose has a keen interest in outreach and has given many public lectures and interviews and also organized various events reaching out to high school students. She has served as a member of the Fermilab Users' Executive Committee and also the US LHC Users Association Executive Committee. She is currently a member of the APS Division of Particles and Fields (DPF) Executive Committee.